CAPE TOWN: As Cape Town suffers its worst drought in a century, residents have been told to restrict showers to two minutes and flush toilets only when “absolutely necessary”. The city-South Africa’s biggest tourist hotspot-and the surrounding Western Cape province have been declared a disaster area by the local government, with just 10 percent of usable water left in the dams supplying the area. Two hours from the city, Theewaterskloof Dam, the main source of water for Cape Town, has been reduced to a flat and sandy desert, with the petrified remains of orchards flooded when the dam was built in the 1970s standing starkly under the sun. At the local watersports club, exposed moorings reveal where sailboats once floated. The long slipway now ends about 30 meters from the water’s edge. “I’ve worked here for about 20 years and I’ve never ever seen the dam this low,” club secretary Lise Wheeler said. For Cape Town residents, the drought has led to a gradual escalation of restrictions, from the limits on splashing at public pools earlier this year to the current complete ban on topping-up swimming pools or watering gardens. The newest restrictions limit residents to 100 liters per person per day and rule out its use for anything other than cooking, drinking and essential cleaning. Last week Virgin Active, a health club operator, said it would close saunas and steam rooms at its gyms across the province. “The best strategy to manage a drought effectively is to manage demand, which is what we are doing,” city councilor for water Xanthea Limberg said. 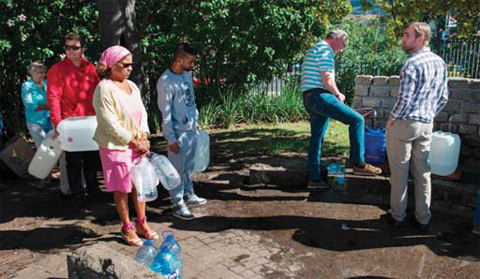 Earlier this year, the city published a name-and-shame list of the worst water offenders in Cape Town, and it says it is issuing fines and notices to appear in court. But officials themselves have faced criticism for failing to implement usage restrictions sooner, and have been accused of ignoring warnings by experts in the years before the drought.